"Ask the RD" is a series of nutrition posts on The Nutritionist Reviews. If you have any nutrition related questions or topics that you would like to know more about, please email me: achernandez711@yahoo.com. Proper nutrition is important for athletes to help them achieve peak performance. Without adequate nutrition, athletes are more likely to get injured, have a lack of energy and perform poorly in their sports. Carbohydrates, protein and fats are all important parts of an endurance athlete's diet. To determine a specific eating plan, consult your physician or a registered dietitian. Carbohydrates are very important for endurance athletes and, according to the Academy of Nutrition and Dietetics, they are the primary fuel for exercise. 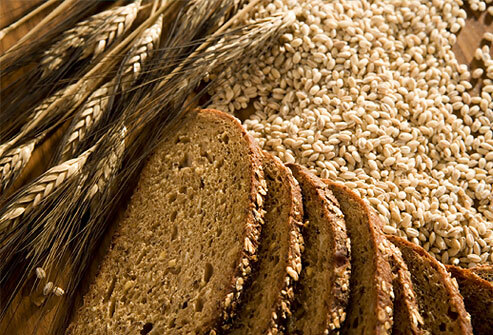 Focus on whole grains such as whole-wheat pasta, bread, rice, crackers and cereals to fuel up. Endurance athletes should consume 3.2 to 5.5 grams of carbohydrates per pound of body weight, according to The Academy of Nutrition and Dietetics. Depending on the duration of the athlete's training or event, protein needs may be increased. The Academy of Nutrition and Dietetics states that 10 to 12 percent of calories from protein is adequate for athletes. Athletes should have 1.4 to 2.0 grams of protein per kilogram of body weight per day or 6 to 7 ounces of lean protein per day. Most Americans consume enough protein that a competitive athlete would need by following a regular diet. Protein supplements are typically not necessary to meet requirements unless you are not consuming the recommended amounts of protein daily. Fat consumption for endurance athletes is important for energy. Focus on healthy sources of fat such as nuts, fatty fish, plant oils and avocados. Limit intake of saturated fats from foods such as full-fat dairy products and meats. Choose leaner versions of meats and trim off excess fat. Dairy products are rich in protein and calcium so including them in your diet is healthy, just choose low-fat or fat-free versions to reduce saturated fat content. Hydration before, during and after an event is important for an endurance athlete since so much fluid is lost during exercise. Athletes should have a few cups of water before the event and 1/2 cup water every 10 to 15 minutes during the event. After the event, endurance athletes should have 2 cups of fluid for each pound lost. Keep fluid intake high for the next 36 hours, since it may take that long to rehydrate. What is your favorite exercise fuel? What do you eat before a race or exercise event?